Munich - Any team which can afford to leave the likes of Mario Gomez and Arjen Robben on the bench is clearly something out of the ordinary. That team, over the past few months, has been FC Bayern Munich. Head coach Jupp Heynckes has been spoilt for choice since prudently and potently strengthening his squad last summer. One of his principle signings, striker Mario Mandzukic, has struck up a scintillating partnership with youth team product Thomas Müller. Between them, the duo have accounted for almost half of Bayern's 51 league goals so far this season - grounds enough to warrant a regular starting slot for each, the world-class credentials of Robben and Gomez notwithstanding. 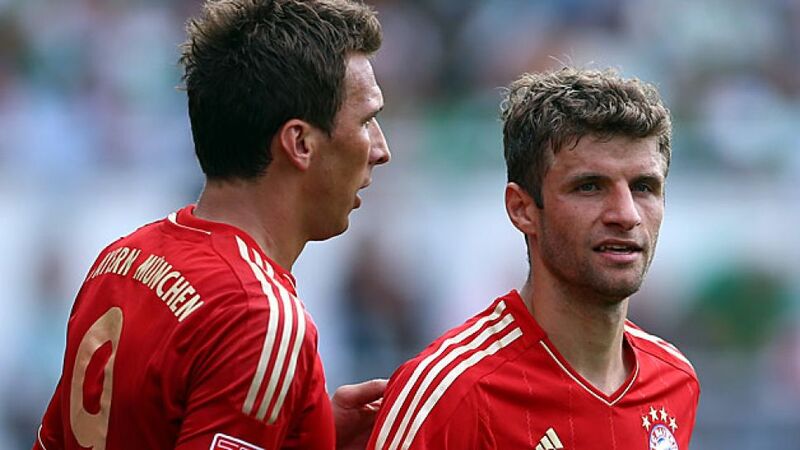 Not since the club’s 1970s heyday have Bayern boasted such a prolific striking duo. Back then it was Gerd Müller and an up-and-coming Karl-Heinz Rummenigge. Now it’s Gerd’s namesake Thomas and Croatian hitman Mandzukic who have chipped in with a combined contribution of 25 goals towards what has been a record-breaking campaign to date for the men from Munich. The price of their success is the potential dissatisfaction of other seasoned stars currently consigned to the bench. Rotation is of course an option, and one which Heynckes stresses he will be deploying over the packed upcoming schedule. For the time being, however, he appears to have settled on a first-choice XI, with Robben and Gomez two of the most notable but by no means the only top-drawer absentees. Robben was the first to leave Mainz’s Coface Arena on Saturday and any journalists quick enough to make it down to the mixed zone saw a none-too-happy figure make his way straight onto the team bus without a word. Heynckes played down the Dutch star’s frustration, saying it would not have been a good sign had Robben reacted any other way. According to Gomez, though, team spirit could hardly be better in the Bayern dressing room and any reports to the contrary are aimed purely at disturbing their push for the title. "The thing which bothers me the most about this discussion is that I want to win the Bundesliga and the media are going to do what they can to prevent that", the Germany forward said. With UEFA Champions League and DFB Cup games filling Bayern's calendar alongside their Bundesliga commitments between now and May, Heynckes is going to need his full array of options ready and available. Keeping Robben and Gomez happy could prove to be his biggest challenge en route to securing a record 22nd Bundesliga title for the Bavarian giants - a problem which can but make him the envy of other coaches up and down the league.